Arundale SkyCafe Sunset Orange Oriole Caged Feeder -[AR500] -FREE SHIPPING! 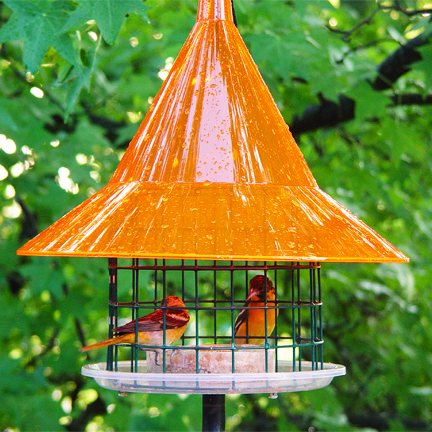 This new feeder combines the patented Squirrel-proof Sunset Orange Sky Cafe dome with a vinyl coated 1 1/2 inch wire form that allows easy access for Oriole. The bright orange dome is a magnet for migrating Orioles and Orioles that are summer residents. The dome also helps protect the jelly, oranges, and meal worms from the rain and sunlight. The cage excludes Robins, Starlings, Blue Jays and other large birds that would devour all the food. Although the Baltimore Oriole is longer than our Eastern Bluebirds the slender body of the Orioles allows them to easily slip through the 1 1/2 inch opening for food. It comes with a New custom made from sturdy UV stable resin (polyethylene). Meal Worm Cup that is removable for easy cleaning. The center food cup is designed and placed far enough from the wire to exclude large birds from reaching through the wire and getting the Oriole food. While the feeder works great for jelly & oranges , the fact that it can be used for feeding mealworms to Orioles is a big advantage since the mealworms don't attract bees like the jelly & oranges do. We often switch to just mealworms in July when bees seem to be the worst. NOTE:Comes with 2’ hanging chain and is pole mountable. Image shows Bluebird Feeder on pole mount. (cord & cord lock sold separately for easy pole mounting for 1 inch outer diameter pole.